The attendant propelled shower commode provides great functionality for someone with limited mobility and where showering and toileting is difficult. In its design, offering a mobile shower chair, over toilet and commode chair all-in- one solution. Ideally making this shower commode perfect for all multi user situations such as aged care/nursing facilities and hospitals. 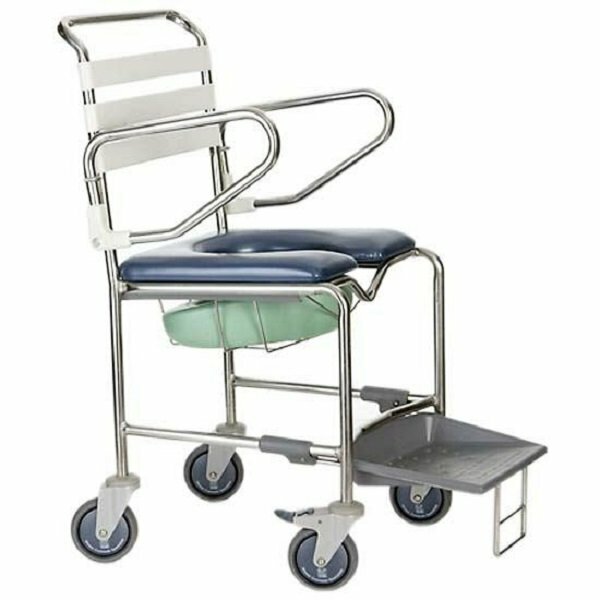 This attendant mobile shower commode provides great functionality with simple to use swing-up arms ideal for side transfers and foot operated sliding footrest. Manufactured from long lasting durable, stainless steel tube, flexible impervious PVC backrest, water resistant castors with 2 front lockable castors. Optional extra- commode tray and commode pan. Specifications: Seat height 59cm, seat width 44.5cm,Overall height 100cm, overall width 51cm, backrest height 36.5cm and a Safe working load of 120kgs. Available in stainless steel and steel pre-zinc and epoxy coated frame.